The automaker wants the Federal Maritime Commission to order payments from Wallenius Wilhelmsen Logistics AS and its sister company EUKOR Car Carriers Inc, Nippon Yusen Kabushiki Kaisha, Mitsui O.S.K. 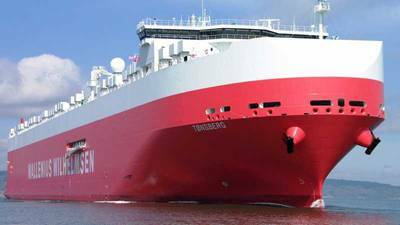 Lines Ltd, Compania Sud Americana de Vapores, Hoegh Autoliners AS and affiliated companies. Fiat Chrysler filed its complaint on Oct. 17. All but one of the shippers sued by Fiat Chrysler pleaded guilty and admitted to price fixing as part of a Justice Department investigation. The remaining firm, Hoegh, agreed last month to plead guilty and pay a $21 million criminal fine. To date, four shipping executives have also pleaded guilty in the government’s probe, which began in 2012. Fiat Chrysler said the companies and “unnamed conspirators have conspired since 1997 to suppress competition” in shipping cargo. The Italian-American automaker said they entered into contracts that resulted in Fiat Chrysler “paying far more” than if there were a competitive market and that the shipping companies made illegal agreements to “allocate customers and routes, rig bids, and fix, stabilize, and maintain” prices. The companies failed to disclose these agreements to the Maritime Commission as a 1984 law requires, FCA said. Other companies, including auto and truck dealers, sued shippers in 2016 before the Maritime Commission but those cases are also pending. A number of lawsuits, including from General Motors Co, were filed under a different legal theory in federal courts starting in 2013. But a federal appeals court ruled in January that the shippers were immune from antitrust lawsuits under the 1984 law. The Supreme Court declined to hear the case earlier this month.